-- I didn't have any pics, so thanks goes to Chris Grossman for some nice shots to go with it. So you want to go for an exotic dive, do you. Well, the Cortes Banks is about as far out there as you can get. 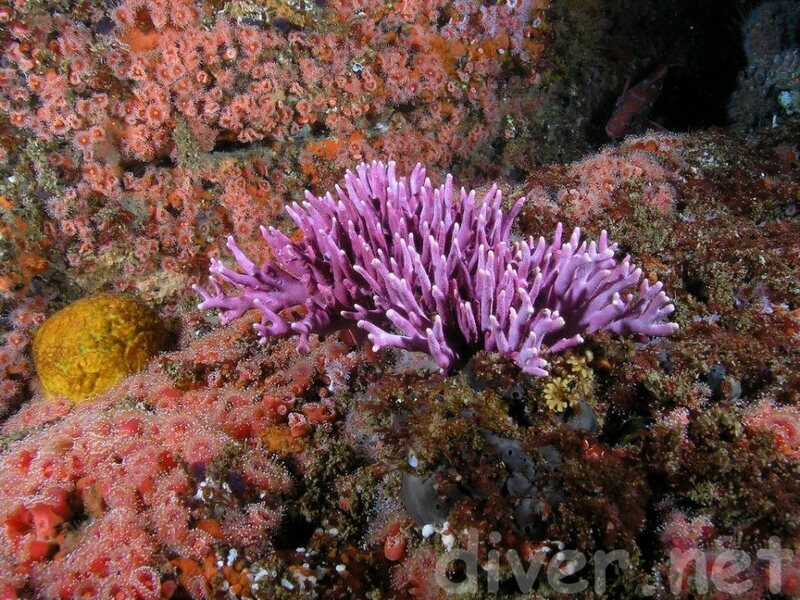 The Cortez Banks is basically a seamount or a submerged island that makes a divable area roughly 7 miles by 2 miles. This actually depends on how deep you are willing to go. The top can be shallow, mild diving like at the islands, but often the boats dive along the sides where it is dropping off and there is better terrain of cliffs and pinnacles. That can be advanced diving that gets pretty deep. It is about 100 miles from San Diego or LA. You figure out where that is. It is almost Mexico. It is so remote that it should be virgin diving. It almost is. Oh, bring your computer. You're gonna need it. There are no rocks sticking up anywhere, but on a big day at low tide, there is a huge break at Bishop rock. It is the only rock there that is pretty near the surface. There is a great deal of kelp though. Only a few charter boats regularly schedule trips there and weather makes it a very iffy proposition. This is true open ocean diving. I got on the Bottom Scratcher in San Diego in the early evening for the 12 hour trip. It is oddly configured for a dive boat, but it is comfortable and there is plenty of room for gear. The crew seemed quite friendly as we got under way and I headed for an early bedtime. Tomorrow was going to be serious diving. 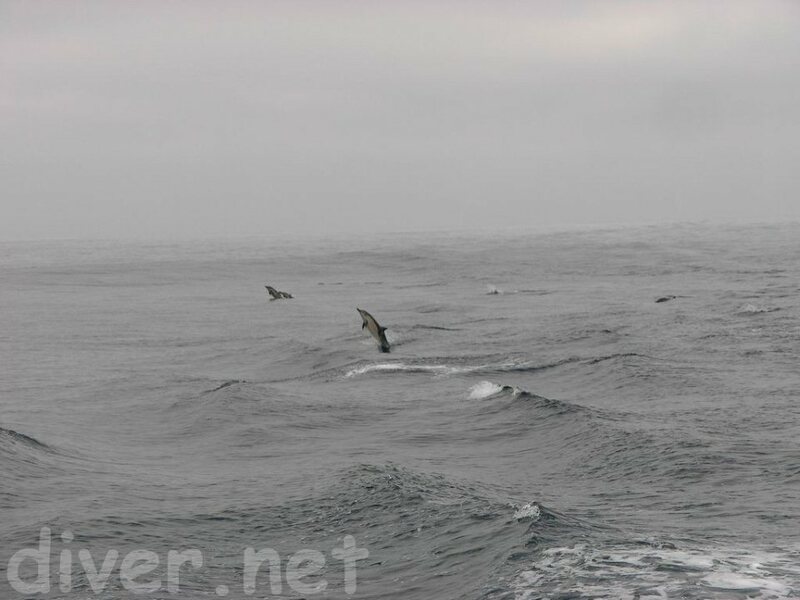 Shortly after dawn we were cruising across glassy seas in the middle of a huge area of kelp beds. Looking down the kelp fronds, it was easy to see that we were going to have excellent visibility. I really liked the calm water. They told us that we had to buddy dive. Steve and I dropped to the bottom in 80 feet and could clearly see the boat above us. We were moving out quick, but the visibility was so high that we could see other divers in a number of directions. Vis was probably well over 150 feet, perhaps 200 in places. That is possibly the best that I have ever seen in California. In visibility like that you can really pick where you are going. We headed along the side of a small cliff towards a saddle between two hills. The bottom had many smaller rocks that looked like great habitat for bugs, but we found mostly shorts. I grabbed at a legal and it went scooting away. Again, the vis was so good that I had no trouble following it to where it had gone under a shallow ledge. I smacked into the ledge and grabbed the bug out. One thing, that shallow ledge was my dive buddy. I doubt that he was really happy about me running into him. At the bottom of this saddle, my computer said that it was 129 feet. We went on up the shallower hill again, completely amazed by the visibility. There was Bull Kelp and many laminarias sticking up about 2 feet. These were great to hold onto or to pull against for traveling. It was not like San Nic, where everything is oversized. It was not like Catalina or Santa Barbara Islands which have plants and critters that like the water a bit warmer. In many ways it seemed like some pristine diving at Santa Cruz Island. 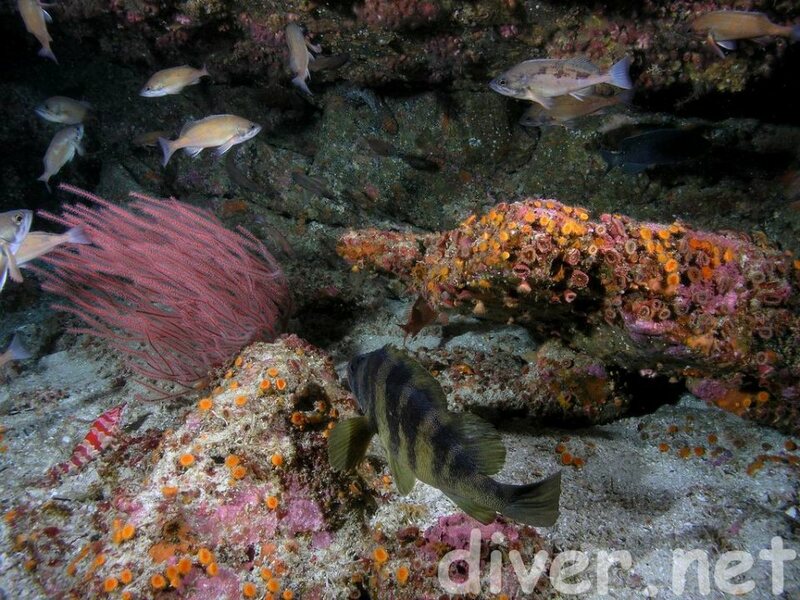 There were small to medium Sheephead everywhere that followed us looking for snacks that we might disturb. The big red urchins were everywhere like they tend to be when they are not commercially harvested. There were lots of bass and bat rays amongst small boulders and rocks. Look closely and there were macro filter feeders, worms, feathers and a number of different types of nudibranchs. As you swim along, you tend to be followed by 10 or 15 mid sized Sheephead. 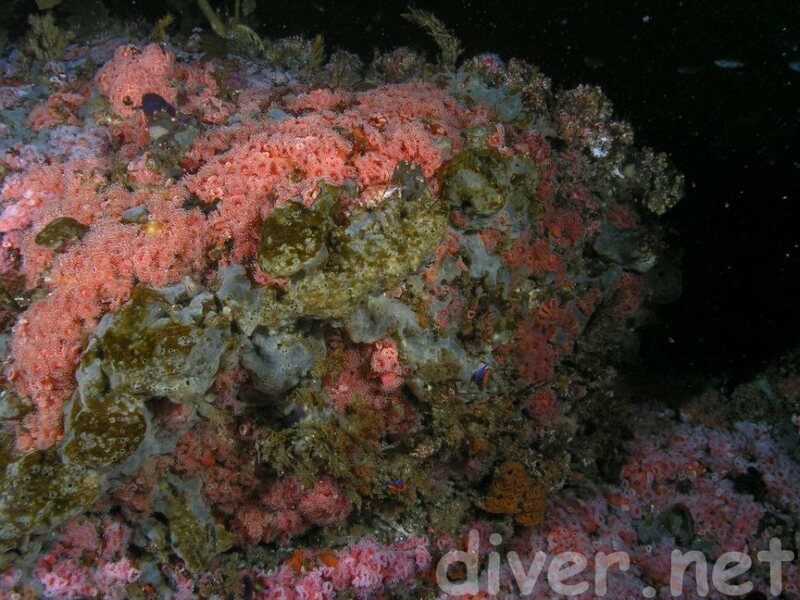 Pink Hydrocorals are fairly common at depth. We did not find many bugs though. The day went on like this. With visibility like this, you just keep diving. I was basically trying to keep my buddy in sight and I think that he was too, but the visibility was so great that you would just look up occasionally to find his bubbles and then continue diving in that general direction. I would come up and the dive master would ask me where my buddy was and I would just point to the nearest diver. Usually it was Steve, because we were staying near each other. Then, about the fourth dive, we slipped up a bit. I zigged once when he had zagged. By then the dive master was not following things too closely, but some of the divers on the boat were making a joke about not even being on the same playing field. Oh well. After the fifth tank, Steve had had enough. I made another dive with someone else and it was getting a bit late. He was had, so I started to take off some gear, when the second Captain, Bob, asked if I wanted to go one more time in the inflatable. I looked at my computer and though the shallowest dive logged 69 feet, I had time left, so "why not". The deckhand dropped us off out about 300 yards and Bob had commented "don't look for me". I hit 70 feet with the intention of making a curve that would bring me to the boat. I found some excellent terrain and followed it instead. There were bugs, but most were short. I did find a couple of legals and almost got a 5 pounder, but it was just out of reach, even with my tank off. In most cases, holes at the Cortez Banks are not deep enough for a bug to get completely out of reach, but they do like holes with back exits. I went to the surface and had a fairly long swim to the boat. It was almost sundown and the sun was dropping through the marine haze when I saw a beautiful sight. Bob was below me in about 80 feet of water and his exhaled air were making a curtain of very fine silvery bubbles that were reflecting the colors of the water and the sunset. It was so pretty that I detoured from the boat to follow his bubbles. 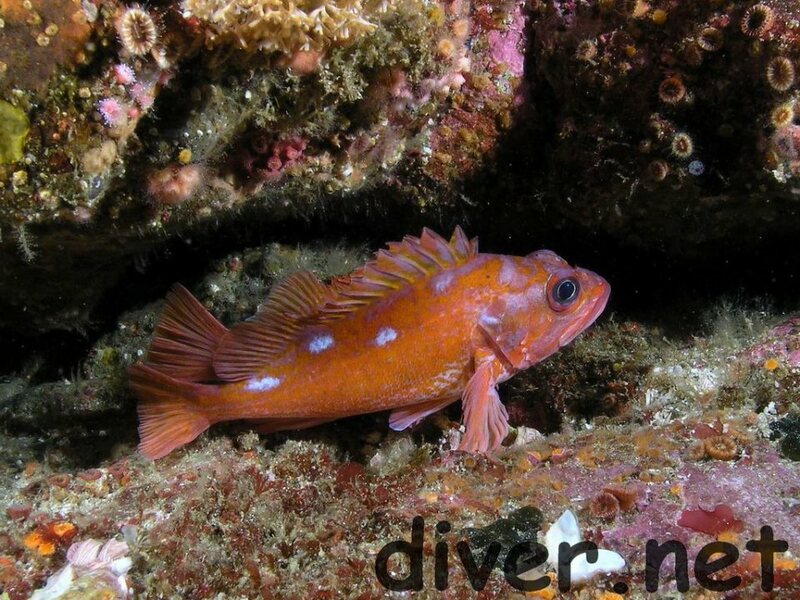 No boat that I have been on will allow night diving at the Cortez Banks. Dinosaur fish show up there at night. Perhaps there, they would more correctly be called "tuna wolves". There are other hazards there, without consideration of sharks, that make night diving a chancy proposition. There is no shore to swim to in an emergency. It was so calm that after a vote was taken and a couple of calls made, we decided to stay the night there and dive the next day, instead of moving in to San Clemente Island during the night. We got up again to glassy seas. We hoped to do better on the bugs today. I went down to 80 feet and could clearly see Steve on laying on the surface. It was so clear that I could not resist offering him a social salute and signaling him to get down here. We were going to try to stick together a bit better today to quell any jokes. Well he came down and signaled that he had noticed that he had forgotten his goody bag. He wanted to go back, but we were deep enough that I nixed that. We traveled along a rock wall with many cracks and holes. There were bugs. True, most were obviously short like the day before, but not all of them and there were a lot. I was grabbing and Steve was trying to put them in my bag. I was in a hole just about to grab one legal when he grabbed my fin to pull me out. No way. I kicked loose and then came out with the bag. We had finally found them. It was a bit wild. When we got up, he said "I know I put 4 big ones in there". Well, there only about 4 big ones and 5 legals. We worked it out. On the next dive, we saw some terrain like I had seen the previous day, but this image still sticks in my mind for its incredible beauty. On some of the dives, the terrain was flat with occasional rocks placed every 35 yards or so. 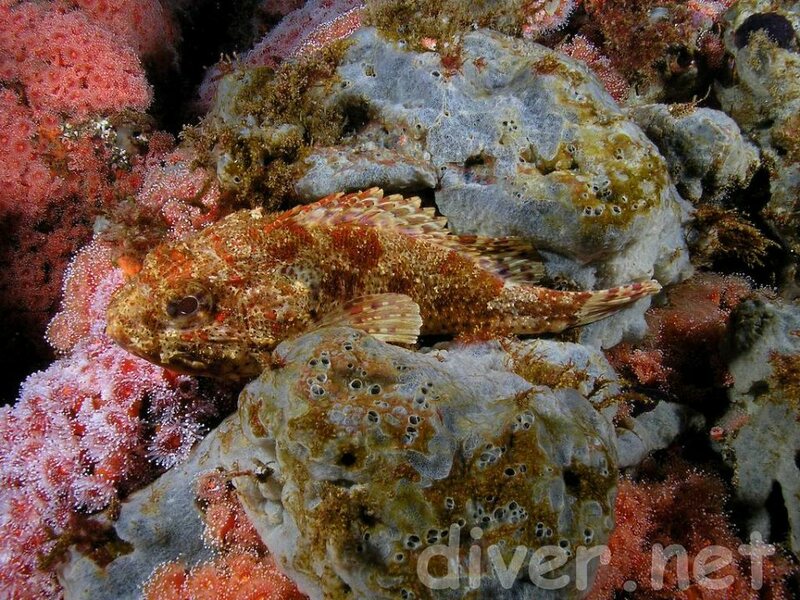 The flat parts were sand and rock, covered with a short lacy golden algae that only grew about a foot above the bottom. The rock piles tended to stick steeply above the bottom about 15 feet and were usually about 20 feet by 10 feet of a very dark rock. On these grew palm tree like laminarias sticking up about 2 feet. It turned out that on top of these rocks, tended to be many short bugs basically in the open with no where to go. At one point I was looking for where my buddy was and I saw a small Bat Ray swimming along perhaps 100 feet away. In the incredible visibility, it looked like a bird in slow motion flight over terrestrial fields of brush. The rock piles looked like miniature, tree covered mountains. It was unlike anything I had ever seen. There are a number of wrecks on the banks. One is the remains of a 400 foot concrete cargo ship. The crew said that we would enjoy diving it. They said "that a way". We were not really very close. Steve and I swam on the surface some and then went down. He was sick of the swim already and at some point headed back in the direction of the dive boat. I kept going on and in about 40 feet, found the concrete ship. Being solo now, I was trying to be a bit discrete. It was a place to make one nervous. Where I was, were the steel ribs sticking about 3 feet out of the concrete hull. There was a strong surge and the steel looked rusted to a pretty sharp point. It did not look promising. I went on to the stern of the ship. This was fairly intact and stuck up about 20 feet. This made for an even nastier surge. There was a round hole, about 8 inches across, about half way up the back. I sort of wanted to look in, but the surge made a fire hose effect through it that was quite intimidating when it was sucking. Look in there and you will never see your mask again. It was a long swim just to it, I was uncomfortable and the dive was rough. Now, the crew did know the way in and where there were bugs. They got some nice ones. I did think it was interesting, but it was not what I was looking for. On my next trip there, when they said lets dive the concrete ship, I went the other way. I took more trips to the Cortez Banks. Some never made it. None had the spectacular water clarity of the first trip. It is always great sight seeing, as it is so pristine. Many divers go there for the chance to shoot Yellowtail or Tuna. The lobsters can be common enough, I usually got my limits, but I never saw any over about 6 pounds. Bob said that big ones up to 10 are more likely to be seen in summer. I had seen lots of abalone, but they cannot be taken now. There were not many scallops to be seen. It is a good place for photography. Bring your computer though. Of the 7 tanks I used the first day, my computer said that they all had a maximum depth of at least 69 feet. The Cortes Banks are very unique and special.